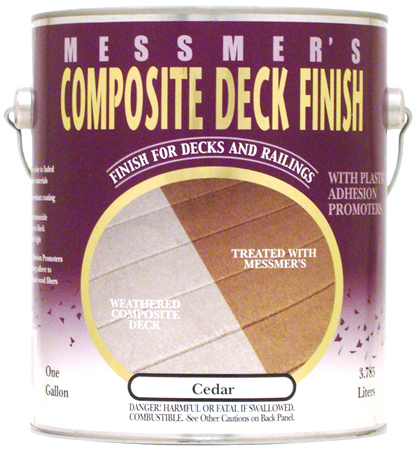 Messmer’s Composite Deck Finish Messmer’s Composite Deck Finish restores, beautifies and protects your old, weathered composite decking material. FAQWhat is Composite Deck Finish? Many factors will influence the longevity of the finish, including conditions such as sunlight, weather and direction of exposure, as well as the amount of traffic the deck receives. In most cases we recommend reapplication every one to two years. In heavy traffic or high exposure areas, touchup may be required more frequently. I thought that composite decking materials didn’t need stain or finishes. Why should I use your product? Although some wood / plastic composite lumber maintains an attractive appearance as it weathers, in many cases it weathers to an unsightly gray color similar to concrete. You can restore an attractive look to your weathered decking by applying Messmer’s Composite Deck Finish. After I applied Composite Deck Finish, there are areas that are shiny and tacky. What happened? How do I fix it? This is caused by oversaturation of Composite Deck Finish on the surface. CDF must be able to penetrate completely to work properly. Remove any excess material promptly. Within 48 hours of application, scrub affected areas with lacquer thinner or MEK solvent to soften excess material. Wipe dry. If product has cured to the point that this does not correct the problem, excess material must be removed by chemical stripping or sanding. Dispose of clean up materials according to local, state and federal regulations. What is the proper temperature to apply Composite Deck Finish? We recommend surface temperatures between 45F and 90F. Avoid application in direct sunlight on hot days. If the wood is hot to the touch, it is too hot to apply Composite Deck Finish. 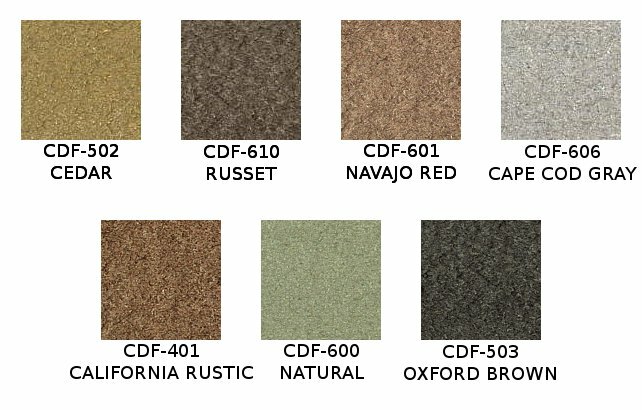 How long should I let my composite deck weather before applying Composite Deck Finish? A minimum of six months in most cases. After the surface has weathered to a light gray color, it should be cleaned with Messmer’s Composite Deck Cleaner, and allowed to dry. After the surface is dry, you can apply one coat of Composite Deck Finish. What brands of composite decking materials are suitable for staining with your product? Any type that quickly weathers to gray after exterior exposure will be suitable finishing with our product. If your decking doesn’t weather and fade to a light gray color, our product is not needed nor suitable for use on it.